It’s my 1 year WordPress blog birthday party, and you are invited! Thank goodness I checked in on one of my favorite bloggers, Kay, yesterday, and saw that she was having her one year blogiversary. It reminded me that mine was coming up soon, so I hopped back on over to mine to see, and soon it was indeed! It’s today! I have enjoyed sharing with you this past year. I am always amazed that so many of you keep coming back to visit me. I’m not the most interesting blogger, not the wittiest, nor most creative. I’m not sure why you keep coming back, but thank you! Thank you for taking the time to visit and share with me. What will we do to celebrate? How about a reward challenge? If you are a “survivor” of reading Randi’s ramblings this past year, I think you deserve a chance at a reward. What is the challenge? It’s simple. Just comment on this blog birthday party post, by the time I stumble out of bed this coming Saturday morning, and settle in front of the computer with my cup of coffee. (that is usually somewhere between 7:30 and 9:00 am central time-sorry I can’t be more specific 🙂 it depends on how tired I am) So, Survivors, wanna know what you are playing for? 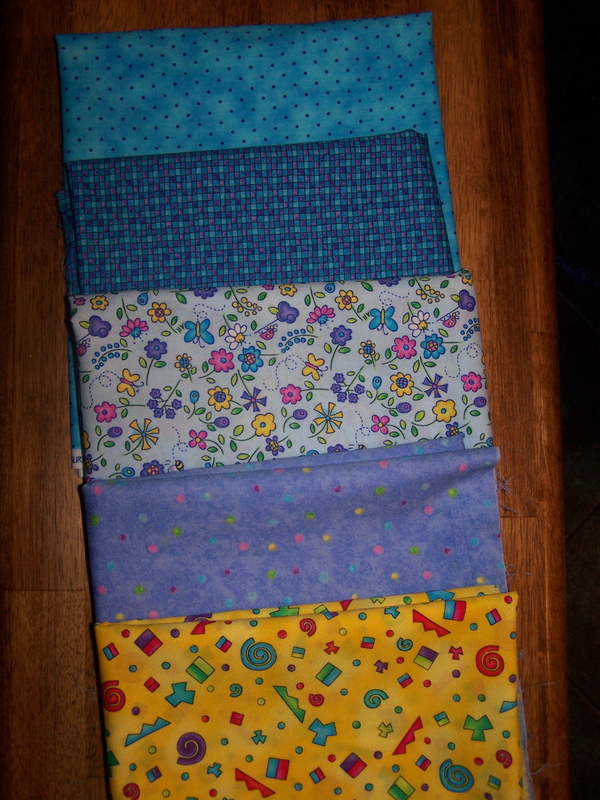 How about one yard cuts off of the five cheeriest, most partying looking bolts of fabric I have in my stash? Worth playing for? If so, get those comments coming! You have til I become conscious on Saturday morning to be included in the drawing! I will post the winner shortly thereafter. Good luck! Randi, congratulations on your one year anniversary! I always enjoy reading about your life, so keep on bloggin’. Happy Blogiversary!!! I have enjoyed reading your blog!!! Randi, you ask why we keep coming back. Cause we love ya!!! You’re Randi, you’re you and it’s refreshing and enjoyable to read your blog! congrats randi! i love your blog and specifically to read about your fearless critter wrangling! wow! i can’t compete with your stash so i’ll have to come up with something else to give away! Congratulations on your Blogiversary! Isn’t blogging wonderful? Hey Randi, I started my blog shortly after you did. I guess my 1 year will be coming up soon. It’s taken me a long time to get in the groove of posting, but I read yours faithfully! I never know what you’ll blog about next!! I guess that’s why I keep coming back. Quilting? Golf? Haircut? Snakes? Flat Stanley? LOL! Your blog is fun to read, keep it up. Happy 1 year blog anniversary!!! What fabric line is that first fabric from? It’s very cute. Randi, Happy one year Blog-versary! I read your blog because you are kind, creative, clever, interesting, gracious and so much more. I love seeing what you are quilting, what you’ve grown in your yard, read what you’ve done on your weekend and feeling like I’ve just enjoyed a bit of time catching up with a dear friend. I’m so glad you blog! I love reading your blog- I am also form the panhandle (although further south than you), and love it when you talk about towns that I know where they are! I really enjoy all your photos, too! I enjoy hearing about you son’s golf trips! Hope you keep blogging for many more years! Happy Blog-iversary! I keep coming back for the snake pics 😀 Just kidding!! I keep coming back for the quilting, the catipillar and all things Randi of course!! Happy blog day! Happy Day to you, and may you have more years of entertaining us! Worth playing for?? Heck yeah! Happy Blogday Randi. I love your blog. I love watching the quilting you do, it so pretty. You are very talented. Love watching your carterpillars too. Your snakes, not so much. lol Have a great day Randi. Happy Blogging Birthday to you! I always enjoy reading about what you are doing. I’ll be at our guild beach retreat over the weekend so I’ll check in Monday evening to see who was the lucky winner. Congratulations, Randi, on your 1st blogiversary. I love checking in on you to see what’s new. I didn’t start blogging until February so I have a ways to go but I will continue to read yours and see what you are doing that inspires me. We may never meet in person but I feel as though you and your family are friends. Keep it up! Congratulations on your blogiversary. I started blogging in November, so I have a ways to go until I hit one year. What a fun present to give. Congratulations, Randi – why come back? Because you are down to earth and a person I would love to be friends with! Of course, it doesn’t hurt that you are a Texan, too!!! You are not only cute as a ladybug but generous too! (I would love to have something from you) Oh and coming back to read your blog is MY treat! Reading your blog is like sitting and having a cuppa with a neighbor, then getting a hug as you head out the door ! I was just thinking about you today. Good to hear from you. Happy anniversary! I really enjoy your blog! And … I’m fighting the urge to do the hand raising “Pick Me, Pick ME!” thingie. Oops…I guess I did do it. (My hand is down now) You truely inspire me and your quilting is a thing of beauty and a work of art. Please include me in your drawing! Looks like you have plenty of us readers! Hope you are enjoying that cup of coffee as you pick my name…smile! Congratulations! I love to read your blog and especially appreciate all of the closeup shots you include of your machine quilting. Happy Blogiversary!! What a perfect way to “bust” stash, give it away…..your report should look positive for this week. happy anniversary….i enjoy your blogs. you don’t have to be witty every day….god knows i’m not. we all just enjoy a peek at your life that you are willing to share. aren’t ‘internet friends’ the best? keep on bloggin’ girl. I have been reading your blog for more than six months and I really enjoy it, especially the beautiful quilt pictures. Happy blogiversary. I’m glad you blog. It’s a great read and great inspiration for us novice folks. Keep up the posting! Happy Anniversary to you. I am just browsing through the wordpress blogs and came across your blog. It is wonderful and I see you like quilts. Wonderful header picture and I shall explore your blog to read more of your work. Happy Blogaversary!!! I love to read your blog Randi! It helps to reduce the miles between us. I also love the combo of quilting, your son’s golf adventures, and your nature interests (including toads and snakes! LOL) Here’s to the next year in blog land!! Happy Bloggie Birthday! I love seeing what you are working on..always inspirational! Looking forward to seeing what else you share with us in the next coming year! Congrats on your 1 year anniversary/birthday! I have enjoyed checking in with you. I love seeing your quilting. You’ve come a long way in the last year. Thanks for sharing with us! Congrats on the anniversary! I think I might have missed mine…I’ll have to go check. Love visiting with you and seeing your beautiful work…keep posting! Congrats Randi! I’m a diehard reader, just rarely comment. Why do we come here, because of you silly! Keep it up– it brightens a lot of days and makes us feel like we’re right there with you (and your son, and your job, and your stash, etc, etc LOL!!). Congrats on your blog-a-versary! I come back to see the yummy quilting! Happy Anniversary – love reading your blog and seeing the beautiful work you do. Your Storm at Sea is gorgeous! Hmm…it’s 7:45 am on Saturday morning. Did I make it in time? Irregardless, happy anniversary. « Time For the Weekly Stashbusting Report!